We are a local pub offering real ales, home cooked food along with a friendly service. Call us on 01293 882468. 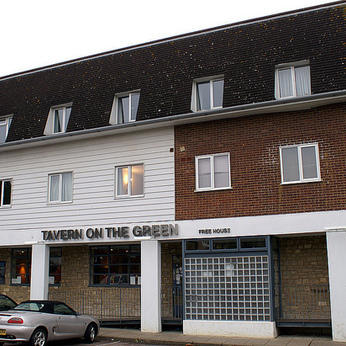 The Tavern on the Green in Crawley is a traditional free house pub overlooking the picturesque green of Grattons Park in Pound Hill. The Tavern on the Green is much more than just a congenial local – its drinks list featuring wines from around the world and extensive range of lager and fine cask ale, ranging from Peroni on tap to Sussex ales from brewers like Harvey & Son, is sure to satisfy even the thirstiest of guests. Offering high quality pub food from seasonal specials to British classics the Tavern on the Green can cater for the lightest lunch to the traditional Sunday Roast. As a family-friendly pub, we pride ourselves on providing food for little people. So we not only offer a children’s menu but smaller portions of some of our classic main dishes. Our expansive beer garden sets the perfect scene for summer drinks and alfresco dining with the family overlooking the green whilst your little ones play in the children’s play area. We are also one of Crawley’s top venues for live sport and can cater for private functions whatever the size or event. So for a warm, friendly hospitable welcome why not join us at the Tavern on the Green today.